Trinity College’s cobblestones were once again given a good soaking after Minister for Health, Leo Varadkar, the Head of Trinity’s School of Medicine, Professor Paul Browne, and the Chief Executive of the Health Research Board, Dr Graham Love showed their support for Motor Neurone Disease research by taking the Ice Bucket Challenge today in Trinity’s Front Square. 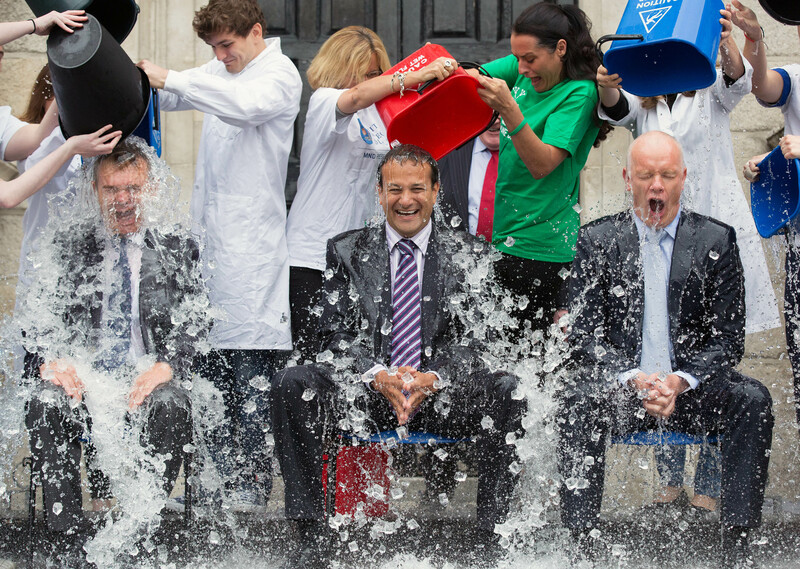 Joined by Trinity College Dublin medical students, this Ice Bucket Challenge follows in the wet footsteps of others taken in aid of The Irish Motor Neurone Disease Association. 25% of all funds raised through the challenge have been committed to fund the MND Research programme, Trinity’s internationally recognised research team led by Professor Orla Hardiman at the Unit of Academic Neurology. The disease, which causes a gradual degradation and death of motor neurons, affects about 300 Irish people, with some 110 new cases reported each year. Minister for Health, Leo Varadkar. Professor Paul Browne, Head of the School of Medicine, Trinity College Dublin. Dr Graham Love, Chief Executive of the Health Research Board. Medical students from the School of Medicine, Trinity.